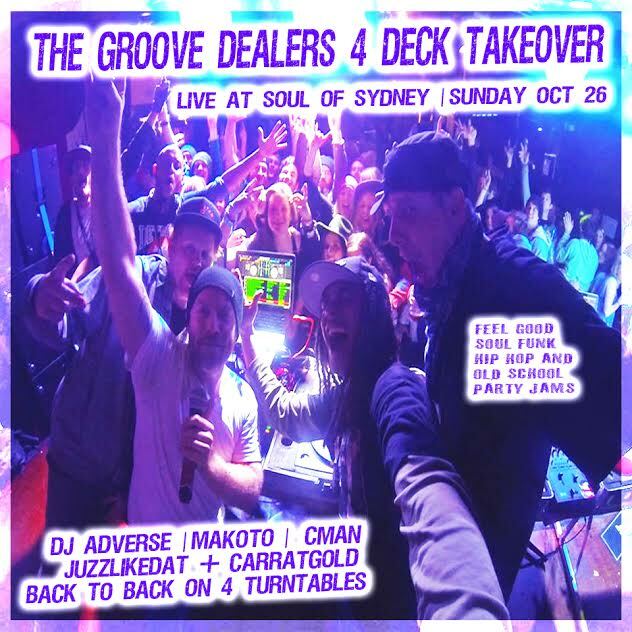 THE GROOVE DEALERS 4 DECK TAKEOVER @ SOUL OF SYDNEY SUNDAY OCT 26 | Sydney Hip Hop | SOUL OF SYDNEY FEEL-GOOD FUNK SOUL DISCO vibes & beyond. playing back to back on 4 decks for an extended old school party set of classic funk, hip hop joints and beyond. THE GROOVE DEALERS will also be throwing down the goodness at SOUL OF SYDNEY with a 4 turntable takeover showcase with some of Soul of Sydney favorite sons, DJ CMAN (Mama Feel-Good funk collective) + DJ ADVERSE (The Groove Dealers) + JUZZLIKEDAT (Legarage Hair & Records) + CARATGOLD & Friends. Strictly afternoon funk, hip hop and old school party jams. Reigning from the heart of Sydney City, This group of DJ and music enthusiasts thrive not only because of their connection to real hip hop, jazz, funk and Afro inspired music, but also because of their ability to grow and change.Their extensive experience, music knowledge and independence has allowed them to explore and incorporate from unexpected sources, resulting in a party atmosphere uniquely their own. . This entry was posted in breaks, sydney funk, SYDNEY HIP HOP, Sydney Hip Hop Dance, The Groove Dealers. Bookmark the permalink.